Quinoa is SO rich in nutrients that the United Nations has declared 2013 The International Year of The Quinoa. At first glance, this does sound a bit bonkers but there’s sound reasoning behind it: ‘The objective of the IYQ Plan is to focus world attention on the role that quinoa´s biodiversity and nutritional value plays, in providing food security and nutrition (and) the eradication of poverty.’ All of which sounds good to us. I served this risotto with these fantastic, easy to make (and, I might add, totally more-ish) Crispy Kale Leaves from Vegetarian Times. 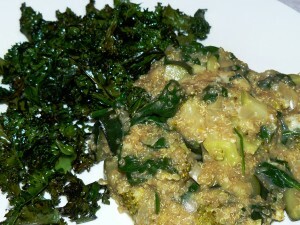 The crispiness of the kale compliments the soft risotto perfectly. So delicious – I’m practically drooling as I type! *True story. I was also six months pregnant with Bibi. 1 Warm the olive oil in a large saucepan over a medium heat. Add the garlic, leek, courgette and broccoli and cook with the lid on for 10 minutes, stirring occasionally. 2 Add the quinoa and vegetable stock. Stir well. 3 Bring to the boil then reduce the heat and simmer gently for 20 minutes, stirring occasionally. 4 When almost all the liquid is absorbed, add the mustard and spinach, stirring well. Cook for 2 more minutes. Note: the consistency should be loose like a risotto – add a little hot water if it’s too stiff. 5 Remove from the heat and add the cheese. Stir well and serve as soon as the cheese is melted. Serve with Crispy Kale Leaves or steamed vegetables. Leftovers (if there are any!) are great hot or cold for lunch the next day.